A brief history because I needed to get it straight in my head. My need to detail this particular regiment’s history is, in a small way, down to Sir Arthur Conan-Doyle choosing the 5th Northumberland Fusiliers as Dr John H. Watson’s regiment but it is mostly due to BBC Sherlock’s John Watson claiming he was also a Captain in the 5th when I know, from my repeated attempts to understand the workings and history of the British Army, that the 5th Northumberland Fusiliers no longer exist. The Fusiliers are a two-battalion Infantry regiment. The 1st Battalion is equipped with the WARRIOR Armoured Infantry Fighting Vehicle and skilled in the complex demands of fast-moving armoured warfare, while the 2nd Battalion is a Light Role battalion with the ability to deploy quickly and adapt to any operational scenario. Where ever the Fusiliers have deployed to they have proved capable of meeting every challenge with courage, determination and a will to win. The Territorial Army Fusiliers (5th Battalion) serve with their regular comrades on operations and on exercise, fitting seamlessly into the tough demands of modern soldiering. I am a Fusilier, trained and ready to deploy. I will defend my country’s freedoms with respect and integrity. I will always maintain my arms, my equipment and myself. I will place the mission and the team first. I will always be one of England’s finest, a Fusilier. Their motto is “Honi soit qui mal y pense” which can be translated directly as “Evil be to him who evil thinks” but is usually translated, within the Fusiliers as “Shame to he who thinks evil of it” or “Shame on him who thinks this evil”. At the date of writing this history, 1st Battalion are currently preparing for deployment to Afghanistan in the second half of 2013 and 2nd Battalion are preparing for operations where they will be based in Cyprus. 2nd Battalion have already been involved in the Afghanistan conflict in a variety of rolls, with many of the soldiers and officers being attached to other regimental companies and units serving on the front line (thanks to the specific skill sets their training provides). The First Fusiliers epitomise the modern British soldier, drawing on regimental traditions dating back to 1674, whilst training and operating to the highest professional standards using modern technology to deliver maximum effect whatever the mission. The Battalion is based at Mooltan Barracks, in Wiltshire. The Fusiliers use the Warrior Armoured Fighting Vehicle (AFV), a formidable tracked vehicle, equally capable of providing the backbone for peace support operations or operating in high intensity warfare, moving at speeds of up to 50 kph across country to deliver overwhelming fire power from the Warriors 30mm cannon and chain machine gun, even before the infantry soldiers carried by the vehicle enter the battle. The 700 officers and soldiers of the First Fusiliers are commanded by a Lieutenant-Colonel and grouped into five companies each commanded by a Major. There are three Warrior companies, a manoeuvre support company (reconnaissance, snipers, anti-tank missiles and mortars) and a Headquarters Company (equipment support, logistics, communications, intelligence, training support, administration, catering, and welfare). The First Fusiliers can deliver a huge amount of capability backed by experience, training, professionalism, judgement and firepower as a modern armoured, digitised Battlegroup. Its command and control systems are trained, exercised and tested using modern state-of-the-art computer simulation systems and rigorous field exercises. However it would be wrong to imagine that the First Fusiliers work alone. This description has been taken from the British Army website here and no copyright infringement is intended. The Second Fusiliers are a superb, operationally hardened Light Role Infantry Battalion. The Regiment has served in every major campaign dating back to 1674, which includes the most recent deployments to Afghanistan. Life in the Second Battalion is always varied and interesting, whether you are a mortar man, anti-tank missile operator, signaller, reconnaissance platoon soldier or machine gunner – you will be at the cutting edge of technology and fighting power. The 600 members of the Second Fusiliers are grouped into five companies. There are three Rifle companies, a manoeuvre support company (reconnaissance, snipers, anti-tank missiles, heavy machine guns, grenade machine-guns and mortars) and a Headquarters Company (equipment support, logistics, communications, intelligence, training support, administration, catering and welfare). The Second Fusiliers can deliver a huge amount of capability backed by experience, training, professionalism, judgement and firepower as a modern Light Role, digitised Battle Group. They have experts in jungle and arctic warfare, the battalion is trained, exercised and tested using state-of-the-art computer simulation systems and carries out rigorous field exercises. As a part of 7 Armoured Brigade (The Desert Rats) it forms an important part of the Brigade’s fighting power which include tanks, artillery, engineers, medical and logistical support. Again, this description has been taken directly from the British Army website here and no copyright infringement is intended. The Regiment as it is today came into being in 1968, merging together the four regiments which made up the Fusilier Brigade Rgts; the Royal Fusiliers (City of London Regt), the Lancashire Fusiliers, the Royal Warwickshire Regiment, and the Royal Northumberland Fusiliers. I’m going to give timelines for each of the regiments in turn, from their creation up to the date they came under the Fusilier Brigade Rgts. It should be noted that the Royal Regiment of Fusiliers did not take the Scottish Irish or Welsh Fusilier regiments – they were merged into their respective ‘large’ regiments; the Royal Scots Fusiliers were merged into the Royal Regiment of Scotland; the Royal Welsh Fusiliers into the Royal Welsh; the Royal Irish Fusiliers and the Royal Inniskilling Fusiliers in to the Royal Irish Regiment. First raised in 1685 by Lord Dartmouth from Tower of London Guards, they were initially titled The Ordinance Regiment but soon became known as the Royal Regiment of Fuziliers. Between 1655 and 1747 the regiment was known by seven different Colonels names and, in 1703, 1718/19 and 1756/57 served as Marines (the Royal Marines were not officially formed until 1755 but can trace their origins back to 1664 and have ties to many Fusilier regiments). In 1751 they were re-designated 7th Regiment of Foot (Royal Fusiliers) – comprised of 1st & 2ndBattalions. In May 1881 they were renamed 7th Foot (Royal Fusiliers) but that was short lived. In July 1881 they became Royal Fusiliers (City of London Regt), still with 1st and 2nd Battalions. In 1948 the 2nd Battalion was disbanded. In 1958 they became part of the Fusilier Brigade Rgts. First raised in 1688 by Sir Robert Peyton as independent companies. Taken into the English service as a Regiment of Foot in 1689. Between 1689 and 1751 the regiment was known by nine different Colonel’s names and in 1701 served as Marines. In 1751 they adopted 20th Regiment of Foot, which they had been ranked as since 1747. In 1782 they were re-designated 20th (East Devonshires) Regiment of Foot – comprised of 1st and 2ndBattalions. In 1881 they were renamed 20th Foot (East Devonshire). In 1898 they became known as The Lancashire Fusiliers. First raised in 1674 by Sir Walter Vane for service in Holland and known as Sir Walter Vane’s Regiment of Foot. In 1688 they were transferred to English service. Between 1688 and 1747 they were known by 12 different Colonel’s names and in 1701 served as Marines. In 1751 they adopted the name 6th Regiment of Foot, which they had been ranked as since 1747. In 1782 they were renamed Regiment of Foot (1stWarwickshire). In 1832 they became 6th (Royal First Warwickshire) Regiment of Foot – comprised of 1st and 2nd Battalion. In 1881 they were renamed 6th Foot (Royal Warwickshire). In 1898 they became the Royal Warwickshire Regt. In 1963 they became Fusiliers when they became part of the Fusiler Brigade Rgts. First raised, for service in Holland, in 1674 as Viscount Clare’s Regt of Foot. Also known as the Irish Regiment and a Lt Col Anselmne’s Regt of Foot. Between 1688 and 1747 they were know by 9 different Colonel’s names. In 1751 they adopted the name 5th Regiment of Foot which they had been ranked as since 1747. In 1782 they were renamed 5th (The Northumberland) Regiment of Foot. In 1836 they were renamed 5th (Northumberland Fusiliers) Regiment of Foot – comprised of 1st and 2nd Battalions. From 1904 they were simply known at the Northumberland Fusiliers. 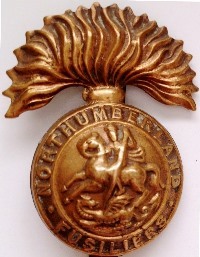 In 1935 they were renamed Royal Northumberland Fusiliers (the 2nd Battalion was disbanded in 1948). 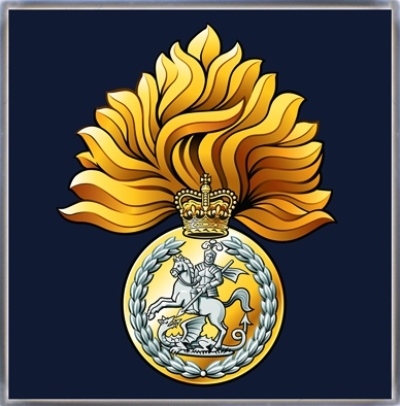 A cap badge of the design which was worn between 1904 and 1935. This is now mine, having been given it as a Valentine’s Day present a few years ago. Since they stopped making them in metal at the start of WWI (as they needed the metal for other things, like bullets and guns) and they didn’t ever manufacture that design in metal again, it is safe to assume, on the balance of probability, that this badge was worn by someone who served in the Regiment at the start of WWI and probably saw action in the trenches on the Western Front. It is special to me because it sparked thoughts of who wore it and what it has seen and could tell me, if only it could talk, which were central to my creation a believable main character for the WWI novel I am working on. ← Malapropism? Or mispronunciation? And does it matter which if it’s funny?